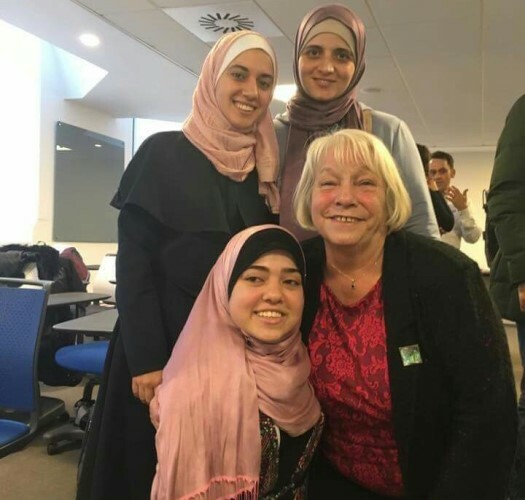 "Let I consider that the most unforgettable moment of the trip was when I had the chance to speak in front of a number of Scottish people and the representative of the Scottish Parliament: Sandra white", said Fatma Majed Lolo. What a gorgeous feeling to be both the hero and the author of your success story! Success is those people who are brave enough to challenge the impossible and fight their fear in order to have a glorious future. As a female student from Gaza where our rights in several fields of life are missed, I began shaping my future with lots of hard working. Not only that, but also I was born with a disability which makes my situation much harder, therefore, I strongly believed in the basic of 3Ps: passion, persistence, and patience. I did fight for my rights and this includes right for education. Also, I challenged my disability and the way how the community looks at me by pursuing my dreams and achieving them. But was it easy for a girl born with special abilities to crush the feeling of lack and then harvest this glory? Definitely NO! My first achievement was the completion of a high school diploma with an excellent GPA of 93%. Significantly, this encourages me to choose the Islamic University of Gaza, joining the Faculty of Arts, English department. This harvest has not come by a mere coincidence; however, it comes by enormous efforts of hundred nights. I do still remember the first challenge of how could I go to the university, return back to my home, and skip a flood of cars that are much bigger and larger than me. It was entirely a miserable memory! On the same point, I was sure that these difficulties will create my own character, motivate my soul and give the power to overcome the obstacles. During the last three years, I enjoyed every single moment, reading Shakespeare's poems and Charles Dickens's novels. I did spend a lot of time and efforts studying and learning subjects that are suitable for my preferences and interests. These subjects included Literary Criticism, Novel, Translation and Academic Reading. Actually, I am genuinely appreciative of my professional professors for their valuable assistance and undoubted efforts. They did support me and offer every possible help from the first day of joining the university till having this opportunity that was an unforgettable experience! My eyes were glittering when I saw the advertisement for the exchange program for Glasgow University. I felt thatthis program met my strong desire to learn more, go deeply in fitting myself in the community, and contribute, like anyone else, in advancing English in my society. After applying for the program, I was more than happy when I got the message of being accepted and being one of the best candidates to represent my university at Glasgow University in the UK. Not only that! I was the student who was selected to enter the semester without a pre-sessional course since I got a great mark in both the exam and the meeting of the host university. Being part of such an outstanding program and obtaining this opportunity have magnificent impacts on my life. Actually, l am 20 years old, and I am planning to take MA. I am a hard worker, and I am eagerly waiting to open a new chapter in MA studies. After completing 100 days in Glasgow, great has to be written about this unique opportunity since it is really a turning point in my whole life. My skills were increasingly developed because of a number of courses I took such as English for Academic Purposes and Research, Language, Meaning and Power and finally Comparative Literature. The methods of teaching were not only depending on lecturing but also giving the opportunity for having seminars. Furthermore, I was able to produce impressive results in a wide variety of areas. I achieved astonishing results on complex tasks that required great attention. Let I consider that the most unforgettable moment of the trip was when I had the chance to speak in front of a number of Scottish people and the representative of the Scottish Parliament: Sandra white, in a welcoming talk held by the University of Glasgow. Sandra White, who was impressed by my fluency in English, expressed her happiness to invite us to visit the Scottish Parliament in Edinburgh. I cannot say except that it was the most stunning days of my whole life. I built great relationships and made close friends. I was totally amazed at Glasgow's people who are cheerful, helpful, friendly, loyal and much more than that. It will always be a pleasure to be a student at Glasgow University which has a number of genius and knowledgeable professors. I would barely feel satisfied and pleased with the absence of their unconditional support. To be honest, they, significantly, encouraged me to indulge myself to shape a splendid future. They did not only teach me literature or linguistic, but they also help me to lead an honorable life. Finally, I am grateful for everyone who played a great role in my academic studies. If I want to describe it, I would say It was basically a challenge, a mixture of fear, courage, love, and support. I wish I could go back again to Glasgow, the place where I taste the true meaning of virtues: sincerity, humanity, love, liberality, and support.